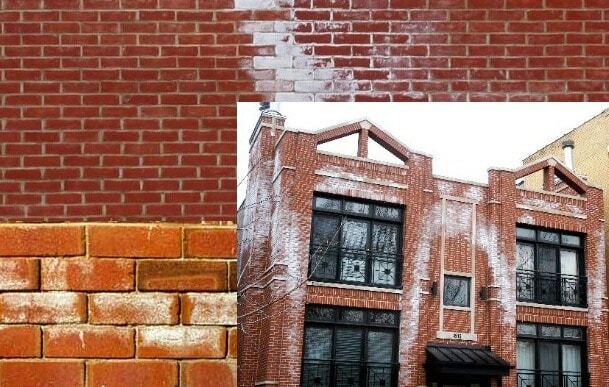 How to Prevent and Control Efflorescence Formation on Masonry Structures? Efflorescence is a white crystalline material that is formed as a result of water evaporation from salt solution and left salts on the surface of masonry. It is demonstrated that, efflorescence originated from cement-based mortar, grout or concrete masonry from which salt solution moves to the brick surface. Efflorescence is generally deteriorating aesthetic view of masonry wall. That is why this article is dedicated to discuss the control and prevention of efflorescence formation. The first step to prevent or decline efflorescence is the selection of materials that has low potential to produce efflorescence. For example, it is recommended to use cements with low alkali content since the possibility of efflorescence formation increases with the increase of alkali content. Moreover, it is advised to specify potable water and clean and washed sand for the production of grout or mortar mixtures. Furthermore, building trims for instance copping, sills, and cops that manufactured from low salt content materials shall be selected otherwise the likelihood of efflorescence formation will increase. Finally, materials can be tested to find out whether they potentially cause efflorescence formation or not. Test methods used for assessment of masonry materials include test method C 67 efflorescence test for brick; chemical analysis of cements to determine water soluble alkali (Na2O K2O) content; chemical analysis of hydrated lime to determine calcium sulfate content; and chemical analysis of sand, water, admixtures and cleaning agents to determine alkali, chloride, and sulfate content. Generally, rainwater can ingress into all kinds of masonry walls to a certain extent, but proper design and detailing can be employed to decline or eliminate the water penetration which subsequently contribute to the prevention of efflorescence formation. Commonly, groundwater contains sizable quantity of soluble salts that may accumulate in masonry and cause efflorescence creation. This source of efflorescence can be removed through watertight masonry below grade in addition to install base flashing to discharge water out of the wall a few courses of masonry above the grade. Finally, it is recommended to use grout or mortar to support base flashing below the air space. Trim materials are usually applied in locations which are considerably weak to water ingression for example coping, caps, and sills under window. These materials are possibly contains salt that increase the chance of efflorescence formation. Therefore, flashings shall be employed to prevent capillary action and avoid the contact between masonry and trim materials. The provision of air space between exterior walls and interior of masonry walls plays significant role in reducing efflorescence formation. There are number of function that air space plays for instance separation of exterior wall from other elements of masonry wall, permits water to drain down the back of the of the brick wythe, and impede the movement of salts from backing material by separating the brick wythe from the materials containing salt compounds. Lastly, for the air space to perform its duty properly, it should be kept clean during construction. If the movement joints are adequately sized, located, and sealed, then water penetration into the wall will be declined to a great extent. Water used for masonry construction shall be clean and free from salts. It is required to separate masonry units from dirt, contamination, groundwater, snow, and rain water through suitable storing. Added to that, these materials need to be covered during construction process with watertight membranes to avoid wetting. Finally, it is advised to protect all masonry materials during transportation when there is a chance of contamination from road salts, fertilizers, and airborne contaminants. Sufficient filling of joints such as head and bed mortar joints in solid unit masonry, face shells head and bed joints in hollow unit masonry, and grapevine mortar joints on the exterior face of the wall is considerably critical factors that must be considered to eliminate efflorescence. This is will create adequate bond between masonry units and prevent the ingression of wind driven water into masonry walls. Covering partially completed masonry works with waterproofing membranes at the end of each working day is a must. If such measure is not considered, the masonry works may be subjected to rainwater and saturated which takes long time to dry. Consequently, the likelihood of efflorescence formation will increase. ASTM Committee C15, 2001. Standard Guide for Reduction of Efflorescence Potential in New Masonry Walls. ASTM. Committee C15, 2001. Standard Test Methods for Sampling and Testing Brick and Structural Clay Tile. The American Society for Testing and Materials. The Brick Industry Association, 2009. Efflorescence prevention and control.